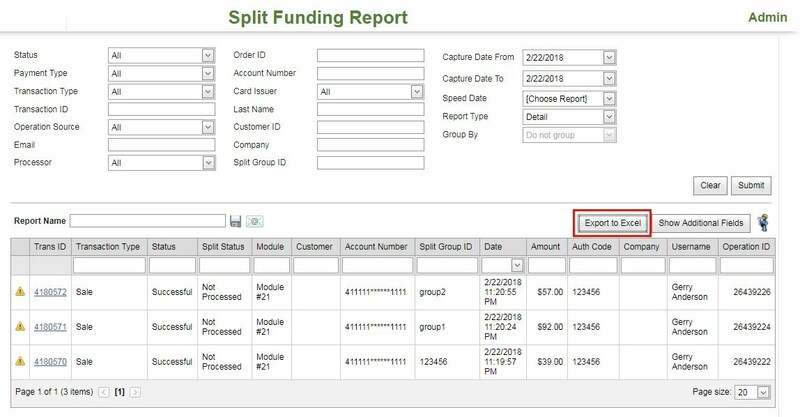 Use Split Funding Report to search Split transactions. Step1: Choose the Split Funding Report item in the Reports menu. 4. Transaction ID the identification number of a particular transaction. Users may also search for multiple Transaction ID numbers at once. Separate different ID numbers by comma to pull up multiple transactions. » Undefined – Transaction source could not be traced. This normally should not happen. » Batch API – From Batch Upload. » Virtual Terminal – Transaction processed in the payment gateway itself. » Service API – Transaction has been created as a result of external call to Services API. » Billing – Transaction is billed. » Payment – Transaction processed in the secure redirect payment page. » Test – Transaction billed is being tested. » Email Payment – Transaction has been created as a result of parsing email orders and will appear only for merchants using this functionality. » Mobile – Transaction comes from mobile device. » POS – Transaction comes from POS application. » Data Vault Payment – Tokenized transactions and planed transactions processed by Data Vault clients. » Checkout – Transaction has been created as a result of a checkout processing. » ARC File – Transaction has been created as a result of parsing ARC File. » Wallet API – Transactions processed by Wallet API. » Gateway UI – Transactions processed in Gateway UI. » Invoice – Transaction has been created as a result of paying invoice. » Split Funding – Transactions processed using Split Funding. » 3D Secure – Transactions processed using 3D Secure. 6. Email the email of the customer. 7. Processor the processor through wich the transaction was processed. 8. Order ID the Order Identification Number. 9. Account Number any consecutive digits from an account number, usually the first six or last four. 10. Card Issuer the issuer of the credit card used for the transaction. 11. Last Name the last name of the customer. 13. Date From and Date To used to refine the date range of the transaction result set. 15. Report Type Determines how the data will be presented in the grid. Detail produces a list. Summary includes summaries and totals with drill down capabilities. Step 3: Click the Submit. Tip: Click on Clear button at any time to reset and clear all the search criteria. » Saved Reports – The Save icon will save this report for later viewing. See Saved Reports for details. » Set Email Schedule - The Email Schedule icon opens the dialog where user is able to set the schedule for sending emails with report to specified email adresses. This report will appear in Saved Reports. » Export to Excel – Use the Export to Excel button to transfer data to Microsoft Excel. 1. Transaction ID – the system generated identification number of a transaction. 2. Transaction Type - the operation used to create transaction (Sale, Auth, Credit). 3. Status – the current status of the transaction(s). The Status may change in the event of a subsequent operation such as Capture or Refund. 4. Split Status – the current status of the split operation. 5. Module – the type of module that was utilized for the processing of the transaction. 6. Customer – customer name. 7. Account Number – the number of the account of the certain transaction. 8. Date – the date the transaction took place. 9. Amount – the amount of the transaction. 10. Auth Code – the authentication code of the transaction. Tip: Depending on the number of transactions displayed, a number of page options will appear below the grid. Use the Previous and Next buttons to move through the pages. Click the page numbers to navigate to a specific page. 4. Remove a Field from the grid - simply activate the Field Chooser window (below) and drag the offending field on to it and release the mouse button. The field will disappear from the grid. 5. Field Chooser - additional fields can be added to the grid by clicking the Show Additional Fields button. Any result set can be exported to Excel by clicking the Export to Excel button. If the list of transaction less than 10 000 rows then the file is exported immediately. If the list of transactions exceeded 10 000 rows then a popup message will appear: "Your search has exceeded the 10 000 row limit. The system will email you when it is ready to download. Continue?" If user selects "Yes", the report generation will be put in queue and the report will appear on the Download Reports page in Not Processed state. As soon as the report processing is finished, state will change and will reflect the result of the export operation: Processed or Export Failed. If "No" - the popup will close and the report will not be put in queue. If the file state is Processed, to download the report the user should click on the Download. If the list of transactions exceeded 300 000 rows then a popup message will appear: " Your search has exceeded the 300 000 row limit. The system can not generate such report. Please update filters to narrow the report." In this case the report will not be unloaded. Any set of search criteria can be saved by entering the Report Name and pressing the Save icon. After that user can view this report on the Saved Reports page. User is able to set Email Schedule for any report by entering the Report Name and pressing the Email Schedule icon. Email - email addresses to what report will be sent (user can specify several emails separated by comma). After all data is entered and the Save/Exit button is pressed the report appears (or becomes updated) in Saved Reports grid. Use Split Funding - Pending Transaction to process split payments. The page shows the following data: Transaction ID with link to the receipt, Transaction Status, Split Status, Amount, name of Merchant Account, Creation Time, ID of Split Group. Step 1: Select checkboxes next to the transactions to be processed. If transaction is not settled, it can not be split. These transactions can not be selected and are marked with a yellow triangle. If an error occurred during processing of a split payment, this transaction will be marked with a red round icon and will have Internal Error for Transaction Status.